For many of Colombo’s theatre goers, Kevin Cruze is the face behind many a dark, gritty play. His fondness for mystery thrillers reflect in his recent projects “And Then There Were None” (2013) and last year’s take on “The Mousetrap” both paying homage to author Agatha Christie and her signature plot twisting plays full of murder and intrigue set against the stiff, gloomy English drawing room. Kevin recalls his senior school days spent immersed in Shakespeare drama competitions where they enjoyed a fair amount of time on the finals stage and the winner’s podium. But it was the school’s 2003 production of “The Prince of Egypt”; another musical, he says, that moulded him to work with the theatrical arts. Thirteen years later, he is back at his alma mater for another musical, but this time in the director’s chair. With the clock ticking away much like Captain Hook’s biggest nightmare. The St. Joseph’s College production of Peter Pan- the Musical is warming up for its takeoff in less than two weeks to go. For Kevin, a calm figure standing in the jungle of scaffolding and energetic youngsters, the transition from serious theatre to musical is quite simply “like test cricket and one day cricket,” he says. The story of the boy who never knew grew up is timeless. Although it is not your typical Christmas musical, the idea to perform it in December was no coincidence. For Kevin, the magic and authenticity of the play is important. It’s why he’s sticking to the traditional story. Although he’s no singer (he admits), the music in the hands of fellow old boy Geethika Cooray’s, choreography is one of Kevin’s strengths. For now the boys are balancing on each other’s shoulders and attempting gazelle like leaps over the Bonjean Hall stage. But the challenge has been the technical aspects of the play, lights and the obvious task of getting Peter to literally take flight. But Kevin is all smiles. “There’s a lot of showmanship and dance.” It’s been thirteen years since the Joes took the stage for a musical and three years since Kevin and a few of the old boys (all notable thespians) came in to revive their school’s strong tradition of drama. “It prepares them to live real life,” he thinks, recalling the effect the arts have had on his growth from teenager to adult. 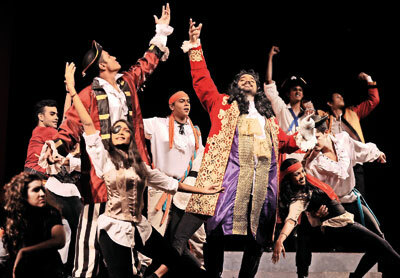 Music director Geethika Cooray predicted their partnership back in 2006 when he was directed by Kevin at the All Island Shakespeare Drama Competition. Singing in the college choir since his days in the primary school Geethika’s understanding of choral music was nurtured by Francis Almeida . He would go on to perform in operas such as “The Pearl Fishers” and “Carmen” (India). 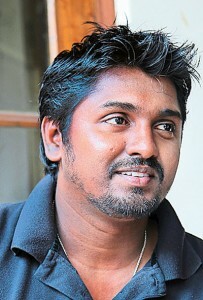 As Director of Music of the Old Joes Choir, Geethika’s ear for music and vision for performance was further influenced by his involvement in musical productions with the Workshop Players. “This initially threw me off,” he admits, when Peter Pan was suggested. Though it was a far cry from the mainstream musicals the young director was familiar with, Geethika found himself falling further in love with the variety of the play’s score and the simple, relatable lyrics. He remembers the story from his younger days but the musical is by far his favourite version, giving more depth to the childrens’ tale and a heritage to each character. They both refuse to pick a favourite scene. But amidst the loud, energetic numbers and equally spirited dance sequences is one moment stripped of choreography as the lost boys crowd around Peter who together with Wendy sings them a lullaby. “It’s a touching moment” reveals Kevin, who finds himself post practices singing the same tune to his own baby. As the echoes of the boyish chorus ring through the Bonjean Hall these next few days and Neverland takes shape it’s clear that all that seems to be missing is the pixie dust. “Peter Pan – The Musical” from December 12-18 at 7.30 pm (and matinees at 3 pm over the weekend) at the Lionel Wendt Theatre. Tickets priced at Rs. 3,000, 2,500, 1,500, 1000 and balcony 700 are available at the Lionel Wendt.